Modern farming is a complex business and requires a carefully considered insurance strategy. Farmers in the rural areas around London, Ontario – including Clinton and Lucknow – can count on McConville Omni for guidance they can trust. Your farm is more than a business. It’s your livelihood and often your personal legacy. And, in our experience, each and every farm agriculture client we've served has unique needs – in terms of coverage for property, business operations and family. Our experienced insurance brokers have been working with farmers and agriculture businesses throughout rural Ontario – and specifically in and around London – for over 70 years. We're proud to know you and your families, and are confident in our ability to help mitigate risk and protect your cash crop, beef, dairy, poultry or hog farm. We'll take the time to tailor your farm insurance plan to ensure you are covered the way that makes the most sense. 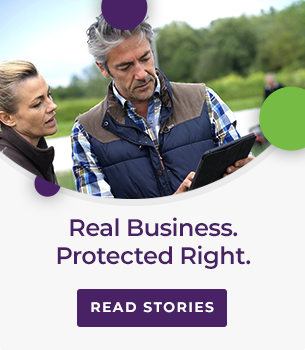 We invite you to give us a call at no obligation, knowing you can trust the McConville Omni team to structure the right insurance package at the best premiums for your farm or agriculture business. We know that the last thing you want is to worry about whether your insurance policy covers everything you need it to do. That's our job. We work as a team, bringing all our experience to every farm policy, to give you the peace of mind you need to feel safe. What is Non-owned Automobile Insurance... and do I need it? We recommend extending liability to include this valuable coverage. This will cover the farmer if he/she sends anyone on farm business in which the individual uses his or her own vehicle. In the event that the individual is involved in an automobile accident, the farmer may be sued. What does Farm Accident Insurance cover? Provides 24-hour coverage and pays independent of other benefits available. The purpose is to provide farms with coverage in situations where they are injured or killed by accident on or off the farm and cannot carry out their functions related to the farm business. When do you recommend Additional Benefits Pursuits Insurance? All activities in addition to the insured’s personal farm operations must be declared as there is very limited coverage provided for an incidental commercial business. Examples of this are backhoe or bulldozing operations, butchering, crop drying for others, or custom farming/spraying. Do I need to insure equipment or machinery that we don't use in regular operations? All farm buildings should be listed on the policy regardless of the use. Any building or structure that is or was designed for agricultural purposes or is or was used in whole or in part for farming or any other commercial business purpose is not included in Detached Private Structures limits, whether it is in use, unoccupied, or vacant. It is wise to have a detailed listing of equipment (both self-propelled or drag) which includes year, make, model, serial number and value. Make sure the value is accurate and takes into account the US Dollar exchange as most equipment originates in the United States. What is livestock coverage and what does it include? Livestock coverage is applicable for agricultural risks, such as your livestock. There are many different forms based on your type of livestock (i.e. poultry, exotic, feedlot) and the degree of coverage is customizable. The coverage is for physical loss or damage originating within mechanical and electrical systems, electronics, or boilers and other vessels normally subject to vacuum or internal pressure. The limit of coverage and premium will depend on your specific carrier.